"I created this dessert because I still had tons of rhubarb hanging around in my freezer and I was sick of the go-to strawberry/rhubarb combination. It turned out amazingly! 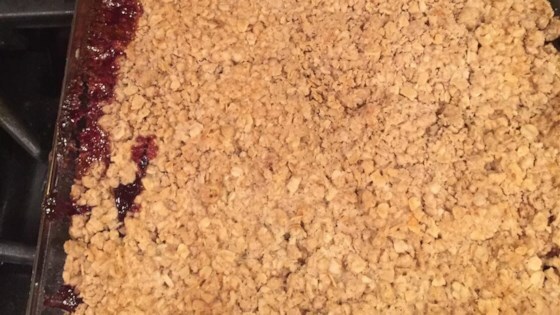 The tart taste of rhubarb is, not surprisingly, complemented by blueberry. Delicious with a scoop of vanilla ice cream." Whisk brown sugar, white sugar, 1/4 cup oats, 1 teaspoon flour, and a pinch of cinnamon together in a bowl. Add rhubarb and blueberries; stir to coat. Pour mixture into a small baking dish. Stir 1/2 cup flour, 1/3 cup oats, cinnamon, and nutmeg together in a bowl; add enough butter to create a crumbly topping, about 1/2 of the butter. Sprinkle crumbly topping over rhubarb mixture, and drizzle remaining butter over the top. Bake in the preheated oven until golden and bubbling, 20 to 30 minutes. Cool for 5 minutes before serving. This was delicious but it had no volume! It came out so flat in the pan. Please, for anyone who is trying this dish, at least double the recipe. Delicious! I quadrupled the fruit filling part and doubled the topping. Baked in 8.5x11 pan. Perfect. I used slightly less sugar.